For those of us aging fast, it is nice to know that one the most beautiful faces in the world is more than 3,300 years old. That face is on the bust of Queen Nefertiti, the wife of Pharaoh Akhenaten, whose reign in Egypt spanned 1353–1336 BCE. This famous artifact, 44 pounds and life-size, has a layer of painted gypsum stucco over a full-featured limestone core. It was discovered a century ago in the ruins of an ancient artist’s studio in Amarna, south of Cairo. First made public in 1924, it fast became an icon of feminine beauty. A slender, smooth neck gives way to skin the color of golden sand. Then come full, red lips; a dramatic, sloping nose; almond eyes; and arching, dark eyebrows. Above the face is a colorful, back-sweeping, cylindrical crown. It’s a lot for the eye to take in, especially since the work was likely just an artist’s model, and never intended for display. The lecture was also a testament to Zivie’s current academic interest: to prove that the Thutmose of the studio in Amarna is the same as the Thutmose whose tomb he discovered farther north in Saqqara. Zivie was nearly 33 minutes into his 51-minute talk before he mentioned Nefertiti. “Of course, we come to the lady, the icon,” he said, teasing the audience first with a picture of the bust from behind. The area of the Thutmose tomb is called Bubasteion, which is now less about mummified pets (thought to number in the millions) and “more and more a New Kingdom necropolis,” said Zivie, the director of the French Archaeological Mission of the Bubasteion and this year a visiting scholar at Harvard’s Semitic Museum. 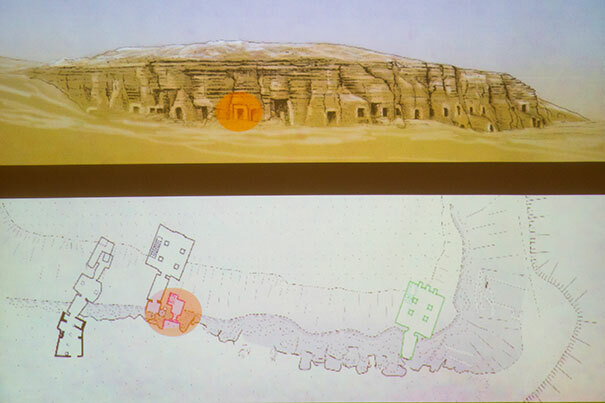 Zivie made his case for the historical Thutmose, a man he called “an exceptional artist who made his own tomb.” He showed his audience the inside. To the left are three preserved painted walls that form a sort of autobiographical triptych. “It’s a lifetime passing by,” he said of the pictures, which include Thutmose, his wife, and children. 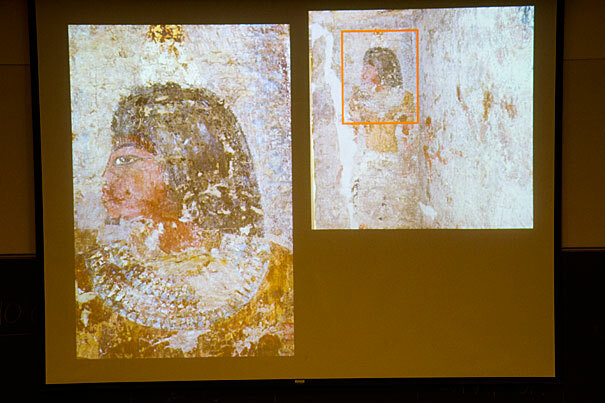 From the audience, Egyptologist Jacquelyn Williamson said during a lively question-and-answer period that, “You have me 98 percent convinced.” Williamson is a Harvard Divinity School affiliate and a specialist in the Amarna Period, when Nefertiti lived. She is a visiting lecturer in Women’s Studies and Near Eastern Studies and in spring will teach a course on gender and sexuality in cultures pre-dating the Bible.